How small, how simple ? – Dirty wet dog , boats and sailing. How small, how simple ? A frequent question of mine for some time now is “how small and how simple can we go with a boat to achieve our aims” ? 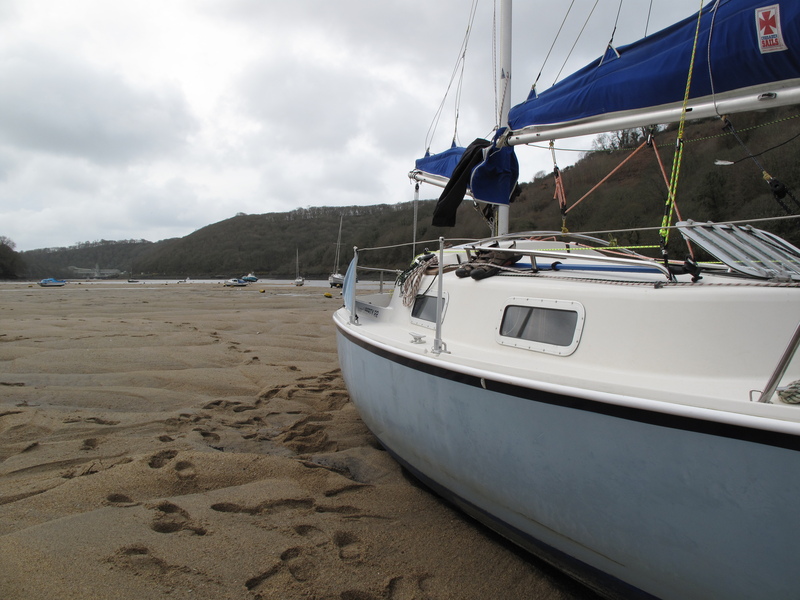 and perhaps the starting point should be to define our aims with the boat first rather than just buying a boat because its the one we like the look of…..as i did with the Frances 26. My aim with the Frances was to outfit the best boat that i could for solo single-handed or short-handed offshore sailing and my influences at the time were very much the Pardeys (Larry and Lynn) who had sailed their 2 boats (24 and 28 feet) just about everywhere and engine-less. Their ideas are i believe still extremely valid for simple and low cost self-reliant ocean cruising but their focus , just like my ocean racing one, was a narrow field and some of it doesn’t apply to the everyday boats and small adventures that i have now. This post i hope will be one of an important series in which i highlight many of the projects that i know about where the boat is surprisingly small, usually very basic and yet does everything that the owner asks of it. I intend to cover several actual boats that are in commission today : may even do some travelling to go see them and talk with their owners. In an earlier post i talked about the time and process whereby i left professional sailing and whilst being completely broke and in debt tried to work out a way of getting back on the water : well this post goes back into similar territory but with the greater experience of sailing and studying small boats. However, at the start i want to establish a personal bottom line in that i will state now that i have no interest in the small ‘freak’ boats that have been built to establish an ever more ridiculous ‘smallest boat’ to sail the Atlantic…or wherever. Those boats hold no interest at all but where i do have a lot of interest and respect is people such as Frank and Margaret Dye and their Wayfarer dinghy, and the Wayfarer has gone on to do many respectable trips : i only reject the type myself because it doesn’t quite fit my basic requirements for a boat now and mainly that i can’t just get inside it for shelter although it might have worked for me going back a few years. Right at the start though and to give an indication of things to come i want to bring attention to a couple of French brothers from the Landes region (Maximilien and Emmanuel Berque) who have designed, built and sailed a series of small boats trans-ocean, the first being a lug rigged monohull at a mere 4.25 metres. (not my picture btw) Again that’s not a boat that would work for me but i can certainly give it all respect and credit as a genuine small seaboat…and yes thats a 14 foot boat with a lid that crossed the Atlantic in good order. I have been trying to get in contact with a couple of blokes that do some serious cruising in very small craft : i haven’t had a reply back from one yet, the other is really busy but has said to use anything that is already in the public domain as he has filmed and blogged his own adventures extensively. Lucky for us that Charles Stock set out the story of the boat and of his cruising ground : the Thames estuary in a book ‘Sailing just for fun’ which is still in print i believe and totally worth buying and reading. Charles Stock also sets out a lot of his thoughts and ideas about small boats and they are all things that i find ever more relevant today. Read that and maybe look again at whatever bigger boat you are sailing and wonder why you are sailing something that saps the funds so much : even here and with a boat only 22′ long i know that i will be paying hand-over-fist for my ‘away’ mooring costs and i know that at times i would much rather have a boat that can live at home. Shoal Waters is i admit a bit too physically small for my 6 foot 2 frame and dodgy back but it didn’t stop me trying to put together a similar project with an ex racing dinghy : an Osprey , sadly the boat was beyond economic repair and i just missed picking up a GRP one recently. I had that project all mapped out, had built a lot of the new parts such as the new bulkheads, deck knees and was working on the centreboard and rudder when i came to the realisation that the boat was beyond my ability to repair especially with its first purpose in mind (the everglades challenge) i even had 2 different rigs planned , first was a lugsail and second was a miniature ketch or yawl a bit like the Devon Yawl…another great boat locally. Although that project didn’t work out i am still keeping my eye out for the boat that i want to do a similar project with and that is the National 18 : there is one that has been converted to lug sail and by all accounts goes like that stuff off a shovel !. That is one project that is merely on standby for me as my idea is still to have a boat that i can take home and keep there on a trailer and then rather than doing a difficult offshore passage, my example being to Brittanny, then instead i would just load it up on the ferry and go trailer-sailing. My actual choice of boat and one i must add that i am very happy with is more based on an essay i believe called ‘the perfect boat’ and is from memory heavily based on the small canoe yawls of the Humber estuary, boats that i really like the look of. I nearly put an offer on a canoe yawl once and they are still a boat i aspire to own, my own boat does a similar job, its just going to be an expensive year that i can’t really avoid to do this stage of the trip. I can only do this trip with a small boat in fact nowadays i can only afford (just about) the smallest and simplest practical boat that will do the job. Next : small and simple, ocean cruising. Previous The boat,the voyage and the skipper.